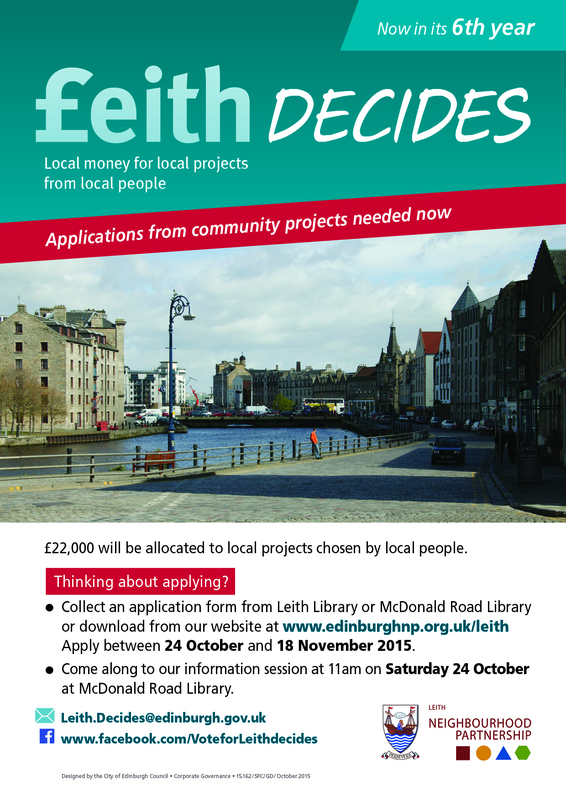 Leith Decides – apply soon! Applications for £eith decides need to be submitted soon. The 7th £eith decides programme has been brought forward in the financial year. In 2014, local people said that alcohol was a factor in some of the issues which needed to be prioritised. Those views are supported by statistical information which tells us that alcohol impacts on the Leith Neighbourhood Partnership area in a number of ways. This is your chance to make the decisions about community projects that are looking for funding. Voting opens on Saturday 6 February 2016 at 12.30pm at the launch event in Leith Community Centre. You’ll have until 3pm to speak to applicant organisations about their projects and the work they do in Leith, and then vote. If you can’t make it along to the event, you’ll be able to see information about the projects and vote in Leith and McDonald Road libraries from 3pm Saturday 6 February until 5pm Tuesday 16 February. You can also print a voting form from the internet and send it to us. Project information will also be available in early January 2016. £eith decides is an approach used by Leith Neighbourhood Partnership to allocate 50% of its Community Grants Fund. This type of approach is called Participatory Budgeting (PB) and allows you to decide about issues that matter to you. If you’re part of a local group you can put forward your own ideas, and then local people vote on them. So it is more than asking people what they think – local people make the decisions. You can also look at the evaluation reports from the last 5 years of £eith decides. You’ll get more detail here about who has applied, how many people have voted and which projects got funding. £eith Decides – Apply now! Just over a week to go for applications for £eith Decides! If you know anyone that’s applying but needs a bit of support to get their application in on time just let Katie Swann know. She can help with getting a group constituted, advice about bank accounts, checking criteria and eligibility etc. If you know a group that works in Leith and could benefit from some funding, networking and a higher profile that HASN’T applied yet, there’s still time. Please share and encourage people to get involved. The Leith Neighbourhood Partnership and the £eith Decides Steering Group are delighted to announce that this year £22,092 will be allocated to local projects chosen by local people.